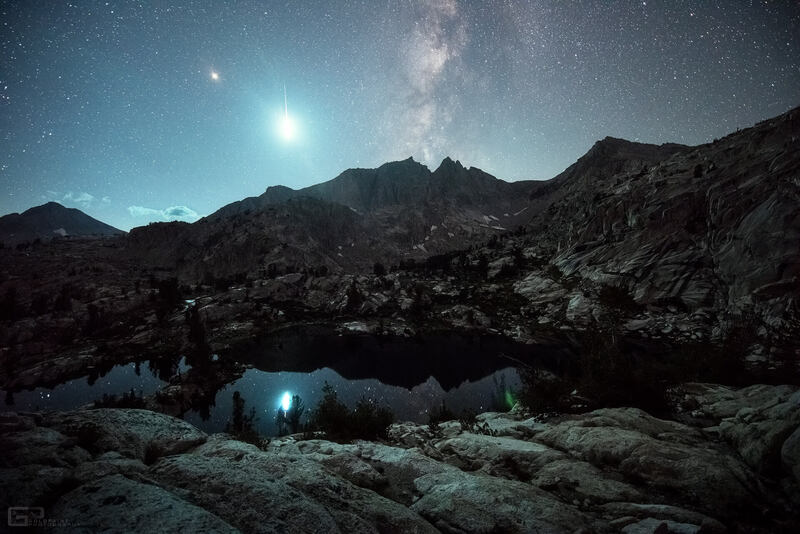 Isolated high atop a lake basin, crystal clear snowmelt reflected a starry sky overhead. A sudden flash from the heavens bathed the darkness with blue green radiance and abruptly illuminated the past. 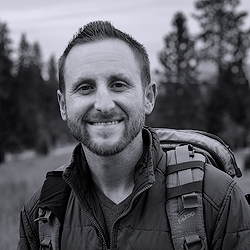 Recently, I spent 6 days backpacking up and over massive peaks within California’s Sierra Nevada mountains. My trip was planned around the Waxing Gibbous phase of the moon to take advantage of moonlit, mountainous and alpine landscapes at high altitudes. From ~12,000-foot elevations, the stars glistened vividly, colorful, and radiant. Challenging daily thunderstorms seemed to follow me around every corner however, I was rewarded each cool night with a few moments of clear skies. 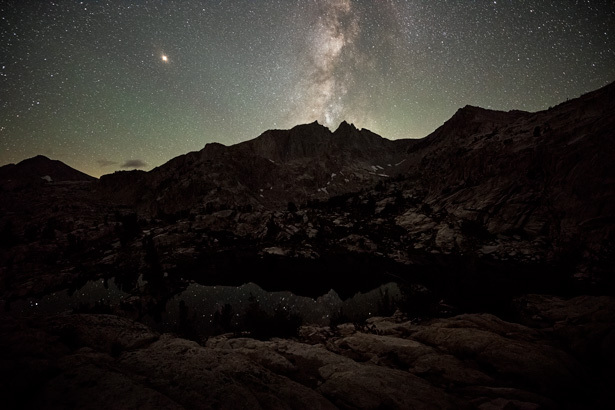 During the third night of the trip, I prepared a time-lapse to capture the moonset, followed by the Milky Way positioning itself behind a 12,700-foot mountain peak in the distance. In a rare stroke of luck, my camera captured an unmistakably massive meteor ‘Fireball’ entering our atmosphere. I thought the most impressive part of the image above was just how brilliant the meteor was. The explosion was so bright it briefly illuminated the entire landscape so I estimated it was -10 magnitude. From my research, this meteor radiated from the area known to produce Alpha Capricornids meteors. 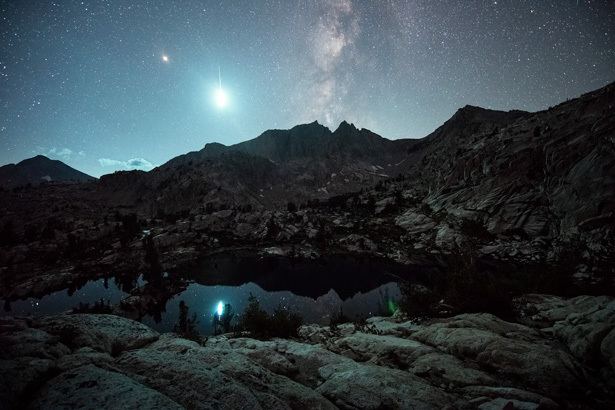 According to The American Meteor Society (AMS), the Alpha Capricornids are active from July 11 through August with a peak time around July 29. This shower is not very strong and rarely produces a handful of meteors per hour. However, what is notable about this shower is the number of bright fireballs produced during its peak time of year. 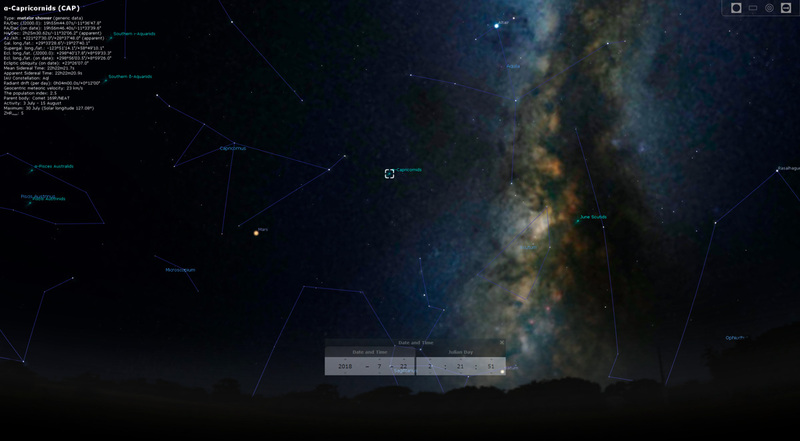 You can see the screenshot from Stellarium and the Alpha Capricornids radiant area HERE. The illustration above shows a comparison of the scene before and during the fireball. View the persistent train in the time-lapse below.